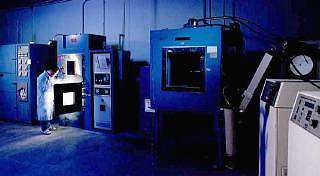 A view of our Thermal Shock area featuring three-stage, two-stage, and single-stage thermal shock chambers. All chambers are equipped with LN2, provided from a single high capacity storage tank. Also pictured are precision temperature forcing systems for small sample testing. A variety of large capacity precision temperature/humidity chambers provide us with the capability of processing a large number of samples simultaneously. 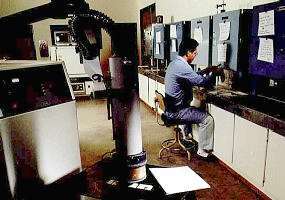 All chambers feature multi-stage microprocessor programming and continuous chart recording of temperature, humidity, number of cycles, duration of cycles, etc. 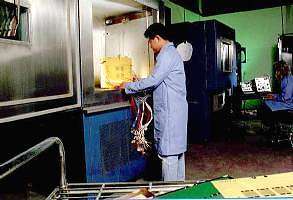 Several bench top ovens being used in a long-term heat aging test of plastic materials. At the time this photo was taken, the pictured ovens had been in continuous operation for two years at the required test temperatures.